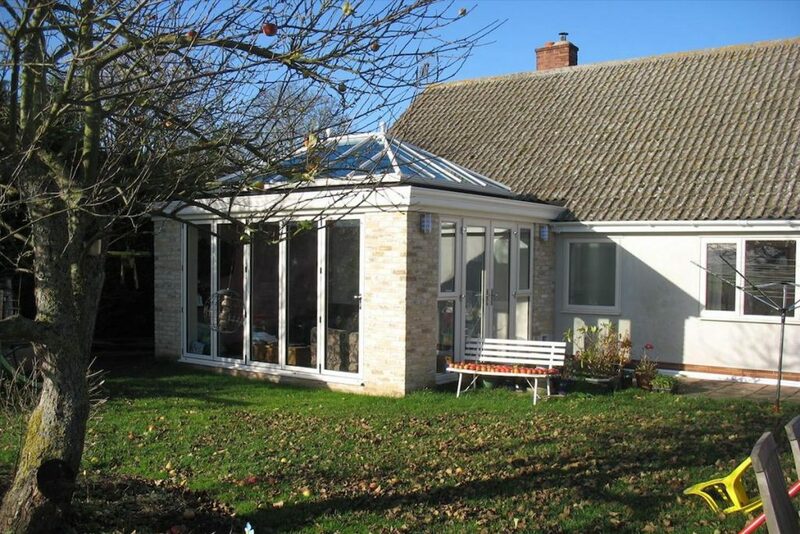 Breathing Life Into A Bungalow With A Fowlmere Orangery. It’s amazing the difference a carefully considered extension can make to a single story bungalow! The owners of this simple ’70’s style bungalow wanted a room that would connect them to the garden, give them a light filled sitting room to enjoy year round and somewhere the whole family could enjoy. Although the windows in their home offered a view of the garden, it just didn’t connect them in the way they wanted it to. With small children, they wanted to be able to watch and care for them as they played outside. They also wanted to feel like they were outdoors while still being sheltered from the burning rays of the sun. They also had a cat which needed it’s own entrance. All in all, the space needed to be adult, child and pet friendly while also providing a sanctuary of calm after a busy day. 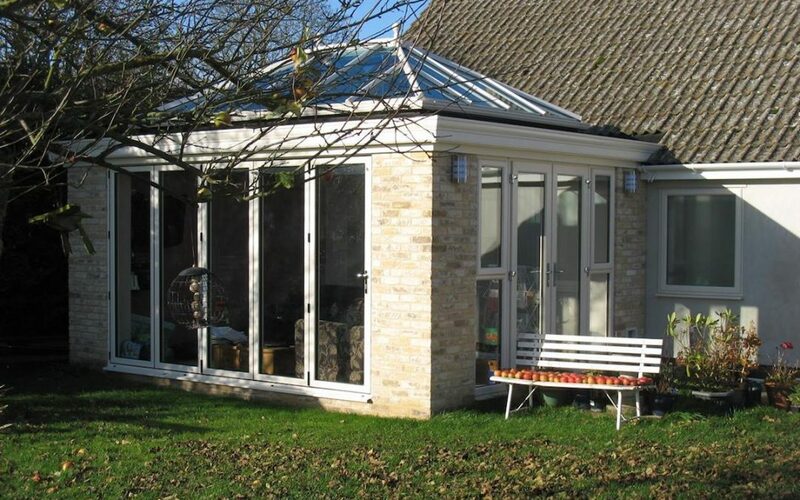 After a visit to the Cambridge Conservatory Centre’s show site at the Scotsdales Garden Centre, the owners fell in love with out display brick orangery and decided they wanted one for themselves. The great thing about orangeries is that they have a timeless feel that allows them to sit comfortably alongside a wide range of architectural styles. They have a classic elegance that enhances any property. And this one was no different. The main house is rendered but the brick of this Fowlmere Orangery contrasts it beautifully. A set of french Doors with sidelight casement windows allow access to a side patio area while a set of five panel folding doors to the front, open directly to a spacious lawned area. With two sides of their new room opening to the outdoors, the owners truly feel as if they’re sitting in the garden. And the lantern roof that is fitted with Pilkington Activ™ glass that offers thermal control for year round comfort. Two neat ball finials finish off the roof profile giving this Fowlmere Orangery a style all its own. And in case you wondered if we’d forgotten the cat … we didn’t. The cat has its own entrance set into the new brickwork next to the French Doors to the garden. 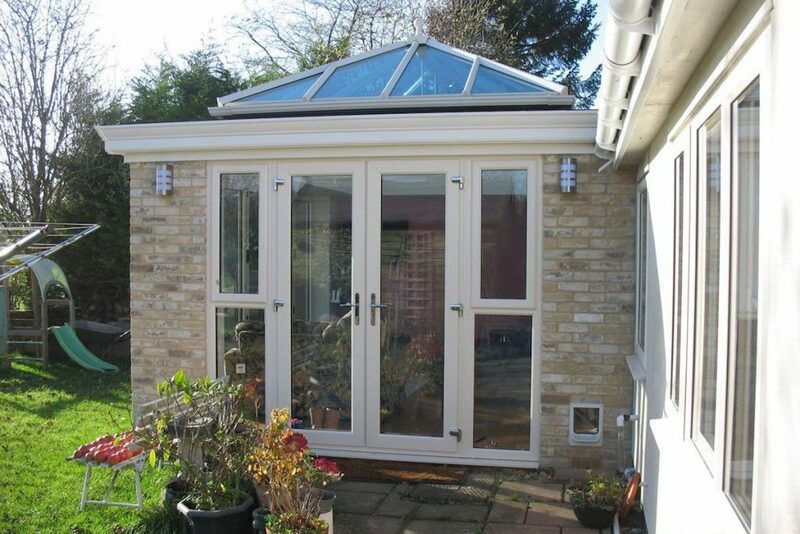 This Fowlmere Orangery really delivers in both style and practicality. We think it’s just fabulous!